“Advancing through this novel is more akin to the elliptical paddling of a canoe’s oar, dipping in and out of the same ocean, the same stories acted by one generation and told by another. 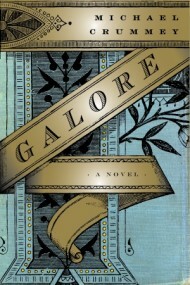 What “happens” in Galore is sometimes marvelous, sometimes overtly expository, and even downright tedious. But it is Crummey’s design, and it is one not dissimilar to the aforementioned works of the magical realism genre.” -At The Outlet, Stephen Spencer discusses Galore, Michael Crummey’s generation-spanning novel of Newfoundland. Your moment of book-business surrealism for the day: The Millions points out that news of The Pale King‘s updated (?) release date comes via a response to a post on the book’s Facebook page. Which seems to be, well, a bit strange. Further debate occurs in the comments, including its effect on independent booksellers (We recommend WORD’s upcoming reading, to be held on April 14th.) Lincoln Michel has more at The Faster Times. At HTML Giant, Blake Butler chats with Matt Bell. Fans of avant-garde music, take note: this Friday marks the beginning of the NYC branch of Poland’s Unsound Festival. Earlier this month, Rob Harvilla took a preliminary look at the lineup. Speaking of The Pale King: Kyle Beachy’s review of the book in question is quite good. Coming to PS1 on Saturday: US Girls, Keith Gessen, Eileen Myles, Helen DeWitt, and more. Chicago’s Jac Jemc has a chapbook, These Strangers She’d Invited In, released today by Greying Ghost Press. On her site, Jemc describes them as “weird Russian stories,” which sounds wholly within Vol.1’s wheelhouse. And tonight, at the NYU Bookstore, the National Book Critics Circle hosts a panel on small presses.